Are you making handmade Valentines this year? Yeah, I’d like to say we’ve got grand creative plans, but we are simply *not* that organized and on top of things at our house. I am still recovering from helping the girls write their own Christmas cards in December. This year, skip the pressure of orchestrating twenty-plus handmade cards. Instead, try a few laid back Valentine’s Day projects to celebrate cupid’s arrival. Rather than feeling rushed to meet the classroom quota, relax and enjoy some simple painting with your little one. Below is a SUPER SIMPLE Play Recipe for creating Heart Sun Catchers with items you already have in your home. 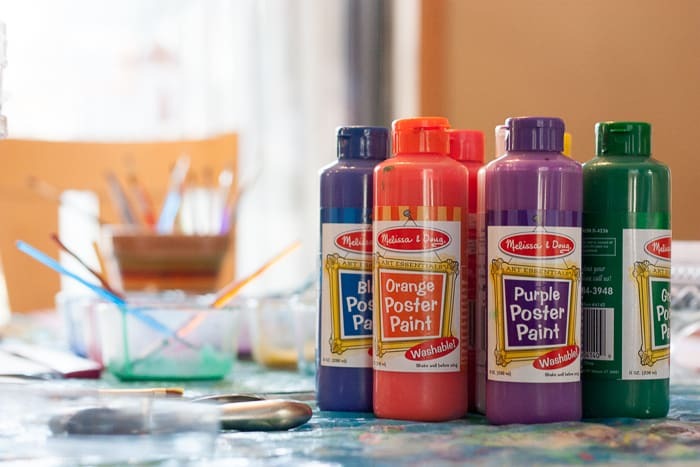 This simple art project will add a bit of color into your home! Cover your table with a waterproof tablecloth. *We use an old shower curtain! Fold coffee filters in half and cut out heart shape. 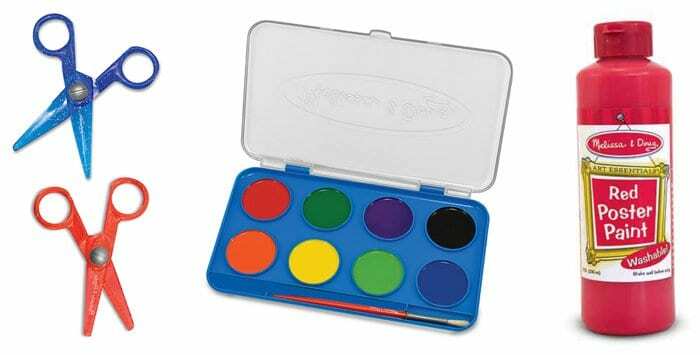 Paint hearts in a variety of colors. Allow painted hearts to dry completely. 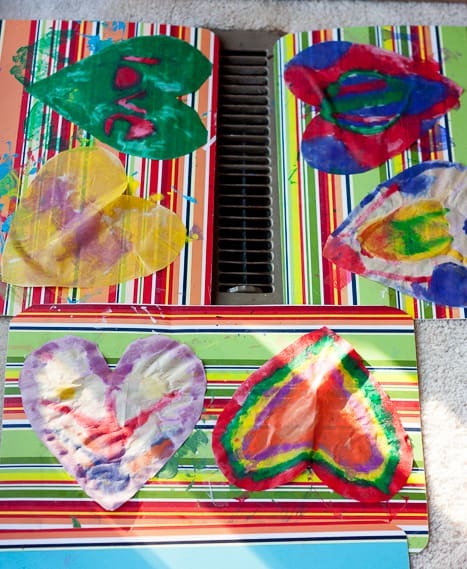 Hang Heart Sun Catchers in a sunny window with tape. 1. Usually people use watercolor paints when working with coffee filter art. 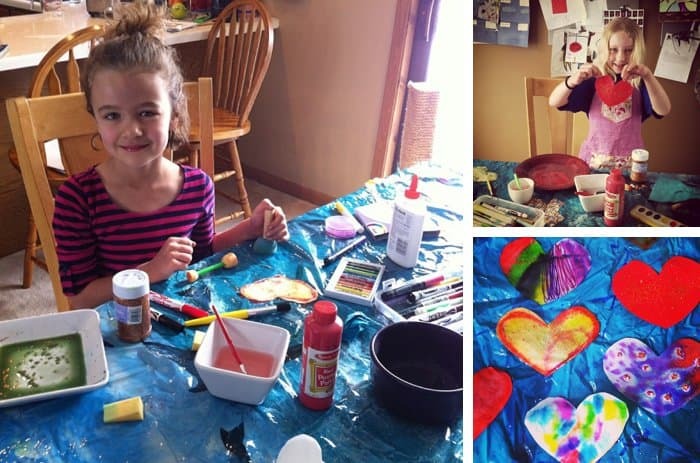 We wanted to ensure our Heart Sun Catchers were vibrant so we experimented with Melissa & Doug Poster Paints. Mixing water with acrylic or poster paint is a great way to get vibrant colors.We started with a 50/50 ratio and adjusted as needed. 2. Pull out the markers. Have your child draw on the coffee filters and then “paint” with straight water afterwards. It creates a cool Tye-die effect [Instagram]. 3. Don’t forget the crayons or oil pastels. Have your children draw on their coffee filters first and paint over them second. This is an easy multimedia project that inspires creativity. 4. Grab the salt shaker. Sprinkling salt onto water based paintings always creates an artistic effect. 5. Ants in the pants? 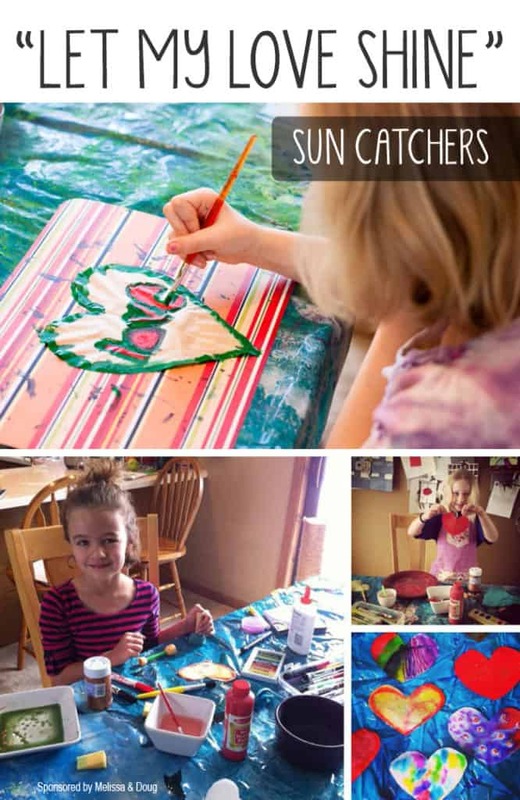 Are your kids super excited to hang their Heart Sun Catchers RIGHT NOW? Try placing your paintings near a floor heating vent to speed-up the drying process. Continue to flip the paintings to ensure they don’t stick to your art mats! Follow our Love & Heart Pinterest board for ongoing holiday inspiration. 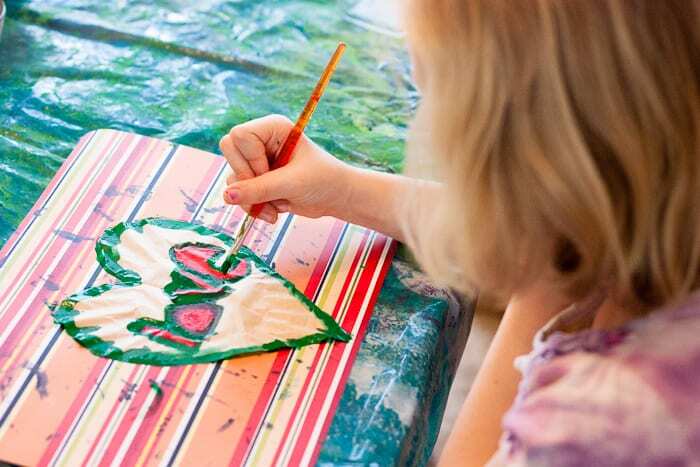 Are you doing any fun Valentine’s Day projects with your family? I’d love if you’d share what you are up to in the comments. Let’s chat. Melissa & Doug Blog Ambassador | Let’s Lasso the Moon is proud to be part of the 2013 Blog Ambassador program. We worked hard alongside Melissa & Doug to explore fun ways to keep children inquisitive and to promote classic creative play. Click here to read our full sponsorship disclosure. See all Blog Ambassador posts by Zina on Melissa & Doug’s blog Playtime Press. Oh your hearts are BEAUTIFUL!! So pretty! Thanks for mentioning our key rings 🙂 we loved making them.